When you give to the Flora of Virginia Project, you support our overall focus: Keep the Science Current. Thanks to the Flora App approach, which is based on data sets, we are now able to make updates virtually instantaneously. As a donor, you also participate in the effort to conserve Virginia’s plants, habitats, and environmental health. Click here to give now via PayPal. And visit the page “Our Gift to You,” under this pull-down menu. 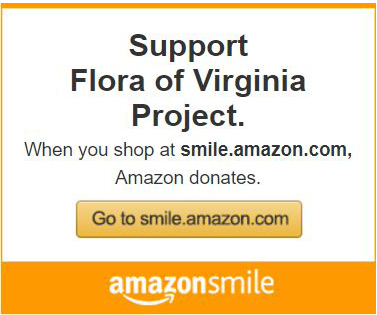 If you prefer to donate by check, write us at Flora of Virginia Project, P.O. Box 512, Richmond, Va. 23218. Here’s how we are able to operate. The Flora Project is a team effort. In addition to staff and board members, the Flora team includes many supporters with many roles. The Flora Project has five official partners—the Virginia Department of Conservation and Recreation, the Virginia Native Plant Society, the Virginia Academy of Science, the Virginia Botanical Associates, and Richmond’s Lewis Ginter Botanical Garden—whose cooperation has been and remains essential. Crucial support in creating the Flora of Virginia Mobile App was provided by a team of dedicated volunteers. Corporations and foundations give grants covering different portions of our work. Scientific and environmental organizations have backed us all the way. Many Virginia colleges and universities are involved, and the project’s advisory board is a who’s who of Virginia science. Otherwise, we depend entirely on gifts from individuals. People are our lifeblood, and your support has shown that Virginia’s plants are in good company. Please continue to give as generously as you can to the Project.